This elusive menu item from Denny’s shows up on their menu from time to time. The Denny’s Fried Cheese Melt is a grilled cheese sandwich that contains fried cheese sticks! If you want one, you can request they make it for you, or, you can make one yourself. Now, first let me say, this isn’t something that we should eat every day, or even once in a while, we should eat this once in a great while. What is this you ask? 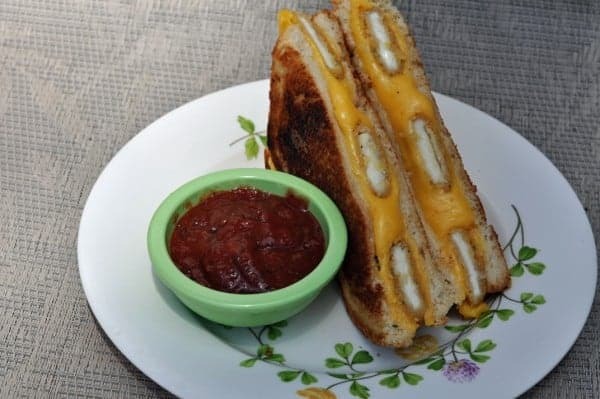 This is essentially a Grilled Cheese on Sourdough bread, with the addition of 4 deep fried cheese sticks served with a side of marinara sauce. Have they pushed our desires for cheesy goodness to far? What’s in Denny’s Fried Cheese Melt? For this recipe I recommend purchasing a box of frozen TGI Friday’s Cheese sticks that come in the freezer section of your grocery store, you can make your own cheese sticks from scratch, but I feel if this is the dish you are eating, you would be willing to take this liberty of using a prepackaged product, this also comes with the side of marina already in the box. What I especially like about their cheese sticks is that they are flatter, and will make your sandwich making easier. So let me conclude with that a couple of bites of this sandwich isn’t bad, it is honestly tasty. I can not finish this much cheese. I had to include in it my collection of free copycat restaurant recipes. Denny’s do not always share the same menu across the US, and everyone should at least see what is available at Denny’s. I am not stating that everyone should eat this sandwich every day, or even once in a while, it isn’t healthy. I have got to wonder how many people actually order this sandwich and how long it will stay on the menu. Make your own Denny's Fried Cheese Melt at home. Heat a skillet low to medium heat. Butter one slice of bread, and place in skillet, cover bread with cheese, you may need to break the cheese slices apart, but be sure to cover the entire piece of bread. Lay down cooked cheese sticks in equal distances from each other, top with remaining cheese, and buttered slice of bread. Cook on both sides until golden brown. Serve with Marina sauce. Love the idea of serving this with Marinara sauce. Try using Mayo in place of butter. It browns the same and taste great. This sandwich is very cheesy but if they take it off the menu, I for one will PROTEST. It is the bomb and worth giving yourself a treat every now and then, even once a month! I hope you let Denny’s know how you felt about this one! You would need to copy and paste the text into the program of your choice and then do a save as. I don’t believe there is a way to do it directly. I have to confess, we loved this.